This rare set of 42 rubbings was from stelae of 'Zizhu Shanfang Lin Gu Fa Tie' – a model-letter compendia by Chen Zhao Lun (1700-1771), (alias: Xingzhai, style name: Jushan). A native of Hangzhou, Zhejiang Province, Chen was a very knowledgeable scholar-official and calligrapher in the mid-Qing dynasty. He commissioned the cutting into stones of the calligraphy of 23 most famous Chinese calligraphers from the 4th to 14th century and wrote colophons to each piece. 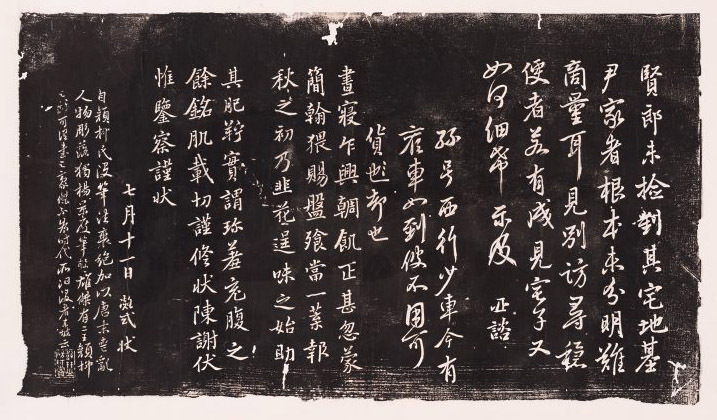 These calligraphers include Wang Xizhi，Wang Xianzhi，Zhang Xu，Huai Su，Liu Gongquan，Ouyang Xun, Chu Suiliang, Su Shi, Mi Fu，Zhao Mengfu, and so on. There is a date at the end of the introduction written by Chen Zhaolun, indicating the original stone was carved in the 28th year of Qianlong, 1763. Judging from the cracks shown in the rubbings, the size of the rubbings and the way they were preserved and bound, this set was made in the 19th century.